The Wigwam Village in Cave City, KY is still open for business. 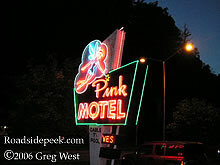 This Frank Redford built motel has been around for over 60 years, entertaining and accommodating travelers looking for a different type of stay off the road. For more photos and information, see Roadside Peek's Spotlight on the Wigwam Village in Cave City.. 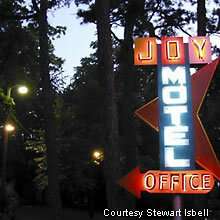 This nice neon sign sits outside of the Joy Motel, with neon boomerang arrow pointing the way in. 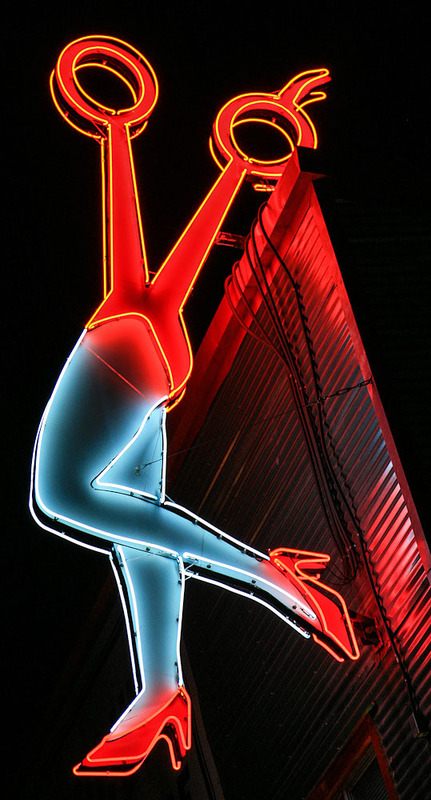 Check out the different colors on this sign and the way the boomerang melds in with the rest of the marquee. 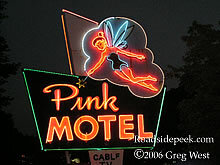 Step into the Pink Motel and you may feel like you are in a fantasyland, but not just because of the neon pixie on the sign. Lodgers will find the action along Highway 441 out their front door and the serenity of the Oconaluftee River out the back. Picnic tables and grills allow visitors to experience the Great Smoky Mountain outdoors. 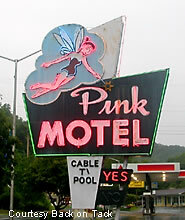 Lillian Schmitt, a long-time manager of the Pink Motel and the Newfound Lodge in Cherokee, passed away at age 85 a couple of years ago, but the business continues on. 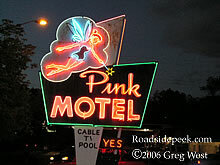 UPDATE 08/06 : (Below) Here are a few additional photos of the Pink Motel of Cherokee, NC taken at night. 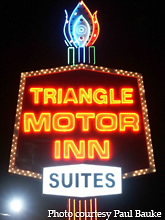 The Triangle Motor Inn sign lights up travelers on US Route 17 in Jacksonville, NC.